Don a climbing harness for the trip to this high mountain resort, where guests sleep in transparent pods attached to the edge of a high cliff above the Peruvian landscape. The only way to the Skylodge Adventure Suites is a combination of zip lines and hiking trails, or by climbing a 1,312-foot via ferrata, a series of metal rungs and cables fixed directly to the rock. Once you’ve arrived, though, your cliffside nest is perfect for relaxing with a glass of Peruvian wine and watching for Andean condors, native vultures whose wingspans reach 10 feet. 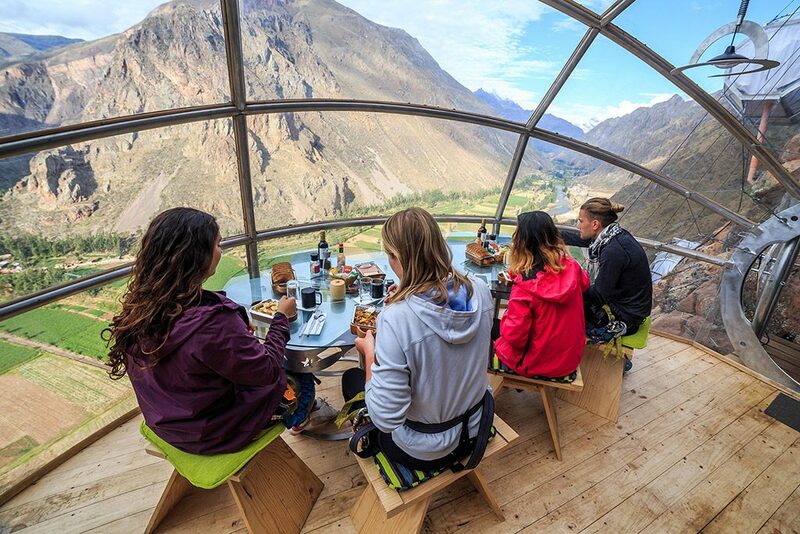 Each pod commands breathtaking (and vertigo-inducing) views of the Sacred Valley, a high-elevation Andean landscape of mountain peaks home to thriving indigenous communities, accessible archeological sites, and preserved colonial-era towns. Skylodge Adventure Suites in Peru isn’t for those scared of heights. Challenge yourself and embrace the amazing views of the Sacred Valley.